The Limousin and Lim-Flex Pen and Carload Show capped off the Limousin activities at the 2019 National Western Stock Show. This year’s show saw 20 pens and 3 carloads exhibited on Wednesday, January 16, 2019. Justin Gleghorn, Amarillo, Texas, Mark Hoge, Good Hope, Ill. and John McCurry, Burton, Kan., teamed up to evaluate the bulls. 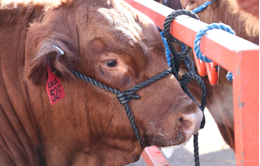 Wulf Cattle Company, Morris, Minn., exhibited the grand champion pen of Limousin bulls. The champion pen included January 2018 – February 2018 born bulls. They combined for an average weight of 1233 pounds with an average weight per day of age of 3.46. All pen bulls were ultrasound scanned at check-in time. This champion pen had average actual scan data of 15.54 ribeye area, 3.14 %IMF, and 0.27 back fat. The reserve pen of Limousin bulls were March 2018 – April 2018 born and had an average weight of 1083 pounds, posting an average weight per day of age of 3.60 pounds per day. Their ultrasound scan data was as follows: 15.29 ribeye area, 2.61 %IMF, and 0.20 back fat. They were exhibited by ROM’N Limousin, Arlington, S.D. The people’s choice champion Limousin pen went to Wulf Cattle Company, Morris, Minn.
Wulf Cattle Company, Morris, Minn., exhibited the grand champion pen of Lim-Flex bulls. The February 2017 – April 2017 born pen had an average weight of 2097 pounds with a 3.10 average weight per day of age. Their ultrasound scan data averaged 20.89 ribeye area, 5.14 %IMF, and 0.47 back fat. The reserve champion pen of Lim-Flex bulls was exhibited by Magness Land & Cattle, Platteville, Colo. The January 2018 – February 2018 born pen had an average weight of 1302 pounds with a 3.67 average weight per day of age. Their average ultrasound scan data was 15.85 ribeye area, 3.73 %IMF, and 0.39 back fat. Magness Land & Cattle, Platteville, Colo., won the people’s choice champion Lim-Flex pen award. In the carload show, Magness Land & Cattle, Platteville, Colo., claimed champion carload. These January 2018 – February 2018 and April 2018 born bulls had an average weight of 1332 with a 3.88 weight per day of age on show day. Their average actual ultrasound data was as follows: 15.54 ribeye, 3.77 %IMF, and 0.41 back fat. The reserve champion carload was exhibited by Magness Land & Cattle, Platteville, Colo. Their pen of January 2017 – May 2017 born bulls weighed 2079 pounds posting a weight per day of age of 3.08 pounds per day. The bulls combined for the following ultrasound data: 19.65 ribeye area, 4.29 %IMF, and 0.49 back fat. The people’s choice champion Limousin carload went to Magness Land & Cattle, Platteville, Colo. Judges: Justin Gleghorn, Amarillo, Texas; Mark Hoge, Good Hope, Ill.; John McCurry, Burton, Kan.
Grand champion Limousin pen: Wulf Cattle Company, Morris, Minn.
Reserve champion Limousin pen: ROM’N Limousin, Arlington, S.D. Grand champion Lim-Flex pen: Wulf Cattle Company, Morris, Minn.
Reserve champion Lim-Flex pen: Magness Land & Cattle, Platteville, Colo.
Grand champion carload: Magness Land & Cattle, Platteville, Colo.
Reserve champion carload: Magness Land & Cattle, Platteville, Colo.
Division II champion: Wulf Cattle Company, Morris, Minn.
Division II reserve: ROM’N Limousin, Arlington, S.D. Division III champion: Symens Brothers Limousin, Amherst, S.D. Division III reserve: Ludens Family Limousin, Viborg, S.D. People’s choice grand champion Limousin pen: Wulf Cattle Company, Morris, Minn.
Division I champion: Wulf Catte Company, Morris, Minn.
Division II champion: Magness Land & Cattle, Platteville, Colo.
Division II reserve: Wulf Cattle Company, Morris, Minn.
Division III champion: Wies Limousin, Wellsville, Mo. People’s Choice grand champion Lim-Flex pen: Magness Land & Cattle, Platteville, Colo.
Division I champion: Magness Land & Cattle, Platteville, Colo.
Division III champion: Running Creek Ranch, Elizabeth, Colo.
People’s choice grand champion carload: Magness Land & Cattle, Platteville, Colo.